Not that long ago, real estate auctions occurred on courthouse steps with a handful of attendees bidding in hopes of acquiring investment properties at deeply discounted prices. Tax sales and foreclosures ruled the day. Today, those auctions still occur, but real estate auctions have expanded to include a wide range of sellers and buyers. Modern-day real estate auctions are gaining in popularity. And those buying these properties aren’t just investors looking to “flip” the property for profit. Many auctioned real properties today are foreclosures but more and more farms, business properties, and even suburban and high-value homes are finding their way into new ownership via auctions. Those interested in buying real estate at auction range from investors to those who plan to use the property as personal homes, places of business, and rental properties. These prospective buyers can find information from a number of sources. One source, Realtytrac.com, maintains a list of properties offered at auction. Prospective buyers can search the database by state or by other variables. 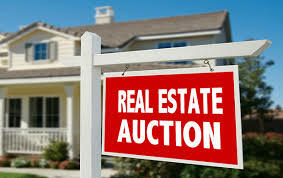 Realty auction information can also be found through Google searches, by following auction companies of interest, newspaper announcements, and even roadside signage. Just as the selling channels have expanded, we’ve also seen an increase in the number of prospective buyers at real estate auctions. Many of those who bought property on the courthouse steps are still actively buying real estate. But many newer real estate investors have entered the arena as online research and auction capabilities have expanded. These newer prospective buyers have learned to use the vast information available on the internet to make themselves competitive with those who have spent decades buying real estate at auction. The internet has demolished the barriers to entry for these auctions. Anyone with discipline and who is willing to do the necessary due diligence has the potential to do well with real estate auctions. Various financial factors influence real estate market strength. Employment levels, stock market strength, interest rates, tax rates, and other market factors affect short term real estate pricing. But long term demand for real estate remains high. Ultimately, people need land, homes, and business sites and they will buy real property once market conditions are favorable. For those who absolutely have to have a property that meets specific criteria, the traditional search through real estate listings might still be the way to go. But for those who are willing to do their due diligence and are somewhat flexible regarding property characteristics, real estate auctions offer the potential for great bargains. If you win, make sure to fulfill your legal obligations. Investment requires an honest assessment of risk tolerance. Anyone can do well with a real estate auction. But there’s always that chance that you could lose money. Before getting involved in such a venture, you should have a clear understanding of what you are willing to lose in case your real estate purchase doesn’t work out the way you hoped. Risk can cover a wide array of issues that each person prioritizes differently. Some people handle stress well. Some enjoy taking chances. Some are gamblers. In addition to these emotional responses to risk, other factors help investors determine whether a purchase makes sense. The classic financial risk analysis takes into account the period of time one has until retirement. If you have decades before retirement, you might be able to take some chances because you will have more time to recoup any losses you might suffer along the way. But those who are close to retirement won’t have that time to cover such losses. When they retire they lose the income stream they’ve enjoyed for years. At some point they may even have to start tapping income from their investments to cover day-to-day living expenses and some may have to liquidate investments from time to time to cover special needs. Except for their own homes, many of these individuals generally need to keep their money in relatively liquid forms. Another critical issue is the amount of money you have available. If you have vast quantities of wealth, losing some of it may make no difference in your lifestyle. But even a modest loss can affect how many people live day to day. Their risk tolerance defines whether they’re willing to take a chance on an investment where a loss could force them to work longer, live in a smaller home, miss out on vacations, and not help their children pay for college. A recent article in U.S. News and World Report hit the nail on the head when it described fear and greed as the emotional drivers that lead to investment mistakes. Real estate offers opportunities for significant financial gain and these emotions can wreak havoc with your decision making. With any investment, there is always the possibility of losing money. With real estate, a loss can be substantial. If you are considering buying real estate you should resolve, right from the beginning, to approach any purchase with cold calculation. During the pre-bidding stage, you should have ample time to do your due diligence and calculate the maximum bid you are willing to make. In the excitement of a real estate auction, once the bidding starts, you might not have time to reflect and weigh factors as carefully and completely as you might like. Do yourself a huge favor and do your math ahead of time. Once the bidding starts, stick to your plan. Auction companies vary in the information they provide about auction properties. Carolina Auction and Realty provides at least fifteen photographs and a video of the property. If the company makes any representations of material fact regarding any aspect of the property, whether positive or negative, they try to include a photograph or two depicting it. But ultimately, it is up to the prospective buyer to inspect the property to determine its condition. Prospective buyers bear the burden of determining all facts about the property that are not specifically represented or warranted. Smart buyers verify the breadth and depth of those representations as well. A buyer might rely on an auction company’s good faith representation of fact and still encounter problems. Representations of condition can be very narrow and specific to a limited aspect of a property or they can be very general in nature and amount to little more than descriptive adjectives that are not considered legally binding representations of condition. Auction companies rarely or never offer blanket warranties. A buyer who wants to do well buying real estate at auction should just do the hard work up front to avoid problems. The first step in evaluating a neighborhood is Google. Google Maps and Google Satellite provide you with a full view of the area surrounding the auction property. Look for things that might enhance or reduce the property’s worth. Next, if you can, drive to the neighborhood and look at the entire area. Are the properties in the area well maintained? Is the neighborhood on the upswing or is it falling into disrepair? Are there abandoned buildings and foreclosure properties throughout the area? If the area is declining, the value of the property you’re looking at is likely declining as well. If the area has been improving, the property you’re considering might offer real value but its price might be nearing the top of its potential. If you cannot inspect inside the property, can you inspect similar properties nearby? They might act as proxies for the property you’re considering, but beware. A property can be in disrepair inside even if it looks fine from the outside. Independent of the state of repair, however, you may be able to surmise the likely construction quality, typical fixtures, and other characteristics of the subject property if nearby properties were built by the same builder at about the same time. Similar properties may also reveal whether asbestos, radon gas, or other risks might be present in the auction property. But again, there is no guarantee that the subject property shares these characteristics with these other properties. You may be able to obtain the floor plan and other documentation about the property from county records as well. This can help you in determining just how similar the subject property might be to these other properties. Take business trends and amenities into consideration. Are the schools well regarded? How is the public transportation? How is the commute to and from city center locations? Are the best routes free or do you have to pay tolls to use them? Is there good shopping nearby? Is trash removal reasonable? Is entertainment available in the area? Are there any colleges nearby? If you are looking at a business property, are there other businesses nearby? Are businesses thriving? The stronger the neighborhood, the more likely investing in it will yield a positive return. Review trends in the area where the property is located. Are comparable properties selling reasonably quickly? Or are they staying on the market for months? Are prices trending upward? Or are they dropping like a free-falling anvil? Are people moving to the area or are they abandoning it like a sinking ship? Check to ensure that you will be allowed to use the auction property the way you want to. Are there any reasons why you cannot use it as a rental property? Are there zoning or other laws that prevent it from being used for business? Even if a county approves such use, are there any state rules that might kill such a use? For example, if your state transportation department requires a business’s driveway be visible to traffic for a minimum of 500 or 1000 feet, a property located on a curve might not receive the go-ahead for use as a business. If you intend to use the property for your home, does it have what you need? Are the room sizes adequate? Is the kitchen functional? Does it have that home office you desperately need? Is there a separate family room where the children can gather for entertainment? Does the layout serve your needs? Are there enough bathrooms? How much will you have to renovate? Are the materials and fixtures adequate? Does it have a yard? Is the property near a busy road? Is there a park or dog park nearby? Make sure the title is clear. A preliminary title report can save you a lot of grief later. Check for encumbrances against the property. These include things like tax liens and mechanic liens, mortgages and second mortgages (including home equity loans and home equity lines of credit). If you have the winning bid, you should buy title insurance. Imagine buying a property for a substantial sum then spending tens of thousands of dollars to fix it up only to have someone step in and take that property away from you. This still happens from time to time, often because many lenders declared bankruptcy after the market crash a decade ago and many misplaced huge quantities of paperwork on properties nationwide. Title insurance protects you against the sudden appearance of claims against the property’s title. Many auction companies set aside one day for inspections, usually within a week of the close of bidding. We are always amazed at how few people actually show up for these inspections. A smart and thorough buyer takes advantage of this inspection opportunity. Bring a qualified inspector with you. The inspector might not be permitted to do a full-fledged inspection but he or she can often give you a reasonable evaluation of the property’s overall condition and make sure everything is in good working order. An inspector may also discover defects that lay people might overlook. Faulty wiring, water damage, structural problems, and roof issues are just a few of the potential pitfalls that can ruin an otherwise good deal. At Carolina Auction & Realty, a weekday close to the end of the auction period will be set aside for inspection of industrial and business properties. Residential house inspections usually occur on the Sunday before the close of bidding. To determine your total cost for the auction property, you must take into consideration your potential maximum bid plus additional costs including the buyer’s premium (10 percent for Carolina Auction and Realty), your estimated repair costs, transaction fees, insurance, and taxes. You may have additional costs to consider like moving, demolition, waste removal, and special installation costs. Add those in, too. Once you have estimated all the costs, you can determine your maximum bid. You’re making these calculations in a calm environment while considering all potential costs you might incur. This protects you so that, once the bidding starts, you know exactly how much you can bid. Stick to your calculated maximum bid! By doing so, you ensure that you stay within your means. Remember, you reached that number during a calm period of time when you were able to weigh priorities, assess your financial situation, and reach a logical conclusion regarding what that property was worth to you. Nothing in the frenzy of bidding will change those factors. If you’re tempted to increase your bid over your calculated maximum, it’s likely because you’re allowing your emotions to overcome your logic. Don’t allow the excitement or those emotions—fear and greed—to get the better of you. Before you can bid in the real estate auction, you must register with the auction company. At Carolina Auction & Realty, you can register online. Carolina Auction & Realty does not require bidders to provide a deposit before participating in one of its real estate auctions. Most auction companies do not provide financing, so if you intend to finance the purchase, you will have to do the financial leg work to ensure you will have the necessary funds to complete the transaction in a timely manner. A finance company representative will tell you what you need to obtain the necessary financing, from tax returns and bank statements to proof of employment, credit history, assets, and other indicia of ability to pay. You will have to provide the required earnest money within a day or two of the close of bidding. At Carolina Auction and Realty, this deposit equals $5,000 to $9,000 on real estate under $250,000 and ten percent of winning bids for realty exceeding $500,000 in value. The auction company will have you sign a purchase agreement. The auctioneer or company representative may explain terms, the timing of each step and payment, and similar information, but consider hiring a real estate attorney who represents you. The auctioneer represents the seller. Your job is to make sure you complete all requirements in a timely fashion so you don’t forfeit your deposit and earnest money. For those willing to do their homework, buying real estate at auction can present some outstanding opportunities. The real estate auction process tends to move quickly, so this type of investment requires flexibility and determination both pre-auction, as you prepare for bidding, and post-auction, as you fulfill your contractual obligations after entering the winning bid. Luck favors the prepared. But if you prepare well, you just might get a great deal on a terrific piece of property.